Conversion Therapy is a pseudoscientific practice of trying to change an individual’s sexual orientation from homosexuality or bisexuality to heterosexuality using psychological or spiritual interventions. There are 14 states and the district of Columbia that have banned Conversion Therapy for minors. There are also scattered counties and communities throughout the country where there is no state ban which have made laws against this practice (see map). This essentially means that in most of the United States, parents can mandate their children to stay in such a program. Since the medical and psychiatric communities have clearly established that sexual identity and orientation (straight, gay or bisexual) is determined at birth, any attempts at re-orientation are doomed to fail and have the potential to create more conflict and emotional turmoil. 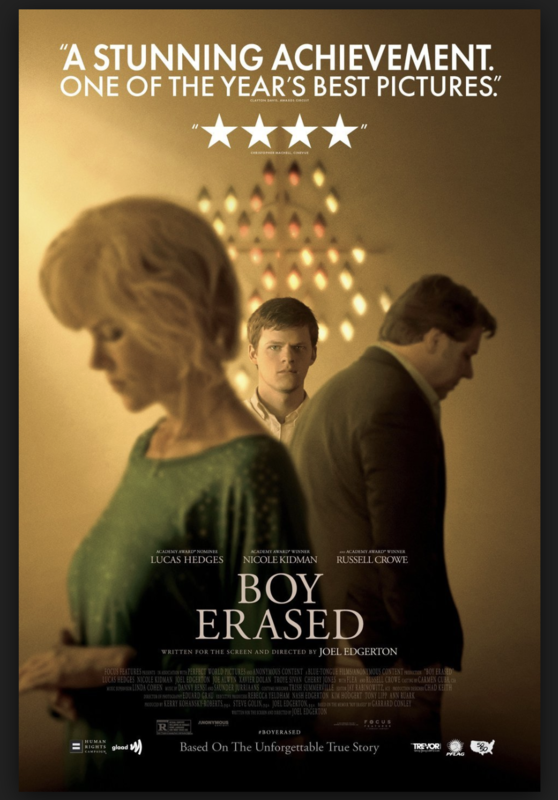 This movie is based on a memoir by Garrard Conley which told his story of being the son of a Baptist pastor who is outed by his parents and then forced to attend a church conversion program with the purpose of “curing his homosexuality”. The experience that he goes through in this program is quite gripping and heart wrenching. The audience not only suffers through seeing things through his eyes but also sees the torment that some of the other attendees are going through which includes one young woman. The three lead actors are outstanding. Lucas Hedges plays the young man. Nicole Kidman is his mother and Russell Crowe (who appears to have put on considerable weight for this role) does an excellent job as the minister who is the boy’s father. The film is directed by Joel Edgerton, who was also the screenwriter and played the role of Victor Sykes, the harsh and heavy-handed leader of the oppressive conversion program. The conflicts, psychological pain, turmoil and anger of the young man were very clear. At the same time, we saw the loving feelings, misguided but good intentions, that the father had for his son. The father-son love for each other despite their major life conflicts was depicted quite well as was the mother’s love and ultimate insight into the situation.